Foxes are cute, I’ll admit, but they’re also a serious nuisance. They’ll eat almost anything, from kitchen scraps in your waste bins to chickens (if you’re raising your own). They’re also more than capable of doing serious damage to gardens (both vegetable and flower varieties). Of course, there’s also the fact that they can burrow under your patio, deck and house foundation, causing quite a bit of damage to your property. 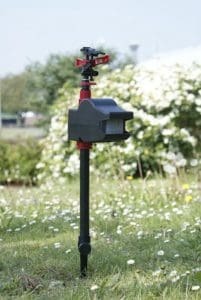 Wondering how to keep foxes out of your garden? If foxes are entering your garden in search of food, get rid of the food source. 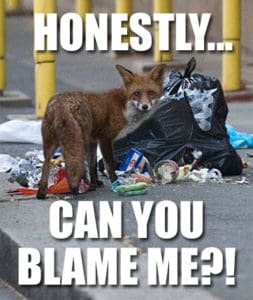 The most common issue here is with foxes getting into your outside waste bins in search of a tasty snack. You can eliminate that problem by using bins with locking lids. Perhaps the single best way to keep foxes out of your garden is to fence the whole thing in. You’ll need to use a metal fence, such as chain link, and you’ll also need to ensure that you have an underground barrier to prevent them from digging under it (hardware cloth works well, or you can buy a taller fence and bury the bottom foot or so in the ground when you install it). The PestBye Jet Spray Repeller is a handy little product actually sprays foxes with water. It shoots a jet up to 10 metres and covers a full 120-degree arc. It lasts for about five seconds, which is more than enough to send the message you want, which is “get off my property”. It’s motion activated, and you’ll find a range of sensitivity settings that you can configure on your own. Like dogs, foxes have extraordinary hearing capabilities. You can use that to your advantage when trying to keep them off your property. While the PestBye Ultrasonic Battery Operated Motion Activated Repeller is designed for cats, it will work on foxes, as well. It’s safe and humane, and can be adjusted to your needs. The motion sensors are infrared to help reduce false alarms, and all you need to do is install the batteries and set them up. If foxes keep coming into your garden, or have even set up residence, it means there’s something there they find attractive. Often, this is a habitat that makes foxes feel safe. It might be a wood pile, or a section of brush in your garden. Foxes will use almost any similar area as a den, so remove it to make your garden less attractive to them. 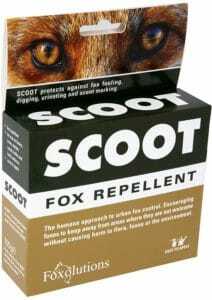 The Scoot 50g Fox Repellent Sachets are humane and will not harm foxes, but they’ll do the trick of keeping them out of your garden. These sachets can be used pretty much anywhere, from trees and shrubs to hard surfaces. On sachet will cover up to 34 square metres of space, and you can apply the repellent with either a watering can or a sprayer if you prefer. Foxes can dig, but they can also leap. If you have an existing wall or fence that’s just not doing the trick of keeping foxes out of your garden, I’d recommend these fence wall spikes. The come in a pack of 10, and they’ll keep foxes out, as well as cats, birds and even people thinking about scaling that wall. They’re even made right here in the UK. While foxes are predators, they’re also skittish and easily startled. 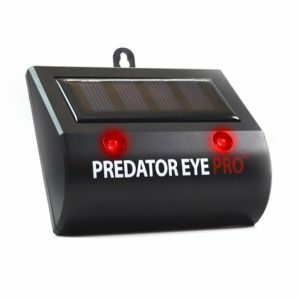 The Predator Eye Pro features two flashing lights that automatically turn on when motion is detected at night to humanely prevent foxes from entering your property. It’s also solar powered, so you don’t have to worry about wiring or any sort of hassle, and all you really need to do is set it out – there’s no setup needed. Have a fence that foxes regularly dig under? Maybe they’re digging under your home, storage building, garden area or patio to create a den for themselves. You can put a stop to that quickly with the Defenders Prickle Strip Dig Stopper. Again, this is a humane way of preventing foxes from entering areas where you don’t want them. It’s weather resistant for a longer life, and you can trip it to fit pretty much any area. It does need to be installed underground, but that’s actually pretty simple and will require little more than a spade. It also works with dogs and cats. If you’re one of those who makes your own compost (and I highly recommend it), you know that those tasty food scraps can attract a great many pests, including foxes. You can help prevent that by fencing the compost bin, or adding a gate or other obstacle. Note that it’s actually better to create a compost area with a hard floor and solid entry barrier. There you go – 10 ways to prevent foxes from entering your garden or setting up house nearby. All of these options are humane and none of them involve trapping or killing. However, if you exhaust your options and find that you’re simply unable to keep foxes out of your garden, it may be necessary to call in the professionals. Hire a pest control company that offers humane trapping and relocation services. Also, as a note, if you are successful in keeping foxes out of your property, double check that they haven’t left kits behind. Most foxes birth in the early spring, so it’s particularly important to verify that you haven’t locked out the parent and left the kits in your garden.